Aditya Hrdayam Again - Part 29 - Apa the Photons..
Before I proceed with Rg Veda, I will take this opportunity to explain Apa, which I translate as photons. Apa is translated as ‘Waters’. Since it is said to be ‘Waters’ at the origin of Universe, Aurobindo translates it as ‘Celestial Waters’. I translated Apah as photons. Photons are Bosons. At extremely cold temperatures they can exist as Bose-Einstein condensate state of matter or as in‘Superfluids’. This bosonic superfluid with zero viscosity and zero entropy are the ‘Celestial waters’ or Apa. Science says the Bose-Einstien condensates occur in extremely low temperatures only which is not the condition in Origins of Universe, where temperatures were extremely high. But it is also seen that Superfluids can exist inside extreme hot cores of neutron stars at extremely high pressures. Thus the ‘Celestial waters’ understanding fits a gas of photons in Bose-Einstein condensate state or Superfluid of matter at the Origin of Universe, probably at extremely high pressures and high temperatures. That Apah is not just waters, but celestial waters akin to superfluid of photons in the early Universe is clearly seen in several Vedic Slokas. This ocean of photons is the adbhya when other bosonic/fermionic matter floats in it. This photonic superfluid, is the Ksheer sagar, white milky ocean, in which Vishnu (which I interpret as Inertia or Rest-mass) floats. The Vishnu or inertia 'rests' on the 'Seshnag', the fermionic quarks (ahi or snake) on the milky ocean of photons. This is the science and beauty behind the Vedas. It means ‘At the origins of Universe (idam Asan), the ocean (salilam ) was filled with Apa only (eva) in which prajapati manifested (sambhavat) like a leafless (aparNe) lotus (pushkar)”. Normally people compare this to the pralaya time of world filled with waters. They say Apah is waters and as in the Pralaya time of world, when it gets filled with water, the origin may also have been filled with water. But we very well know at the origins of Universe, there was no water. Science says at the origins of Universe, Universe was filled only with Photons. Universe was a cosmic ocean of Photons at the origins of Universe according to science. This gives a first indication that Apa could indeed be photons. The desire/attraction that joined grew inside prajapati's mind is let loose here. Thereafter Purusha approaches the mind that makes the expression and does its action. About this idea, it is said which extremely grew/joined at the start is the Mind, manifested as the first seed. From the above it is clear that this prashnam talks of origins of Universe and that fills the origins of Universe, according to science is Photons and not any water. If in fact any 'celestial' waters was there, it is indeed the ocean of photons in which the early Universe floated. In this series, in fact I mapped manasa or mind to mesonic superfluid (Varuna) and Purusha to Dark matter. This sloka also says it is Purusha that makes the Manasa the seed of this Universe. That means Dark Matter is the one that makes Mesons the seed of the Universe. In other slokas it is said that Purusha invokes the ‘agni’ in prakriti. That means Dark matter invokes the ‘fire’ or transfer of energy in matter. 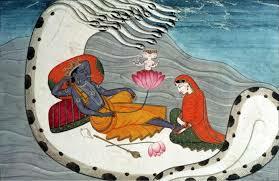 Purusha or Dark Matter is said to be the 'bed' on which the sacrifice(Yajna) of prakriti evolves. The Purusha catalyzes the transfer of energy in matter without being impacted itself,as it is the bed on which matter evolves. The role of dark matter is another discussion. Currently science says dark matter does not impact matter. But if this understanding is correct, then dark matter does impact transfer of energy and creates the mesons, as the first seed of the Universe. Thus it says Apa carries the ability/strength in its womb to give birth repeatedly on its own. Which has the ability and strength to give birth to beings repeatedly from molecules to chemical compounds to life.? It is ofcourse photons and Light. “The seizing/capturing (grhNAti) Apa are four (catushTayya); four are (catvAri vA) the forms (rupAni) of Apa; Lightning (vidyut) of the cloud (Megho); thunder (stanayitnu) of the rain (vrshTi); they all contain (avarundhe) Apa (tAny eva avarundhe); Heat (Atapati) that rain captures has Apa; In the beginning of Universe, Apa provides all the Energy/Vigor/divine radiance (Brahmavarca)”. The four forms of Apa are 1. Lightning 2. Thunder 3. Heat 4. Energy in the beginning of Universe. The beginning of Universe was filled with High Energy Photons (High frequency) according to science. What is common between Light, sound, Heat, Energy at beginning of Universe. This Sloka says it is Apa. Science says it is Electro-magnetic radiation or photons. Photons cause Light, Sound, Heat and were at the origins of the Universe. Science says early Universe was a cosmic ocean of light. One can understand why people reading this sloka thought Apa is waters and Universe began in some kind of water and twisted it to ‘Celestial waters’. Without the knowledge of modern science it is not possible to understand that light,sound, heat and even early Universe were all caused by Photons . Hence they visualized it as some special ‘water’. But ‘Celestial Waters’ is indeed photons. The thought wishes (cit vita) to seek/desire (Kama) to rain (VrshTi), rains Apa. The ‘elemental cloud’ (parjanya) becomes (bhavati) abounding in rain (varshuko) knows that for sure (yah evam Veda). The thought (cit) wishes (vita) to rain Apa, if it desires to rain. The clouds understand this. From this it looks as if Apa is like water. But the next few stanzas set the perspective. The unbalanced (amayAvi) thought wishes (cit vita) the Apa remedy (apo Vai bhesajam) ,does make it the cure (bhesajam eva asmai karoti). Everything (sarvam) gets (eti) Life. The unbalanced thought-wishes Apa as remedy, makes it a cure. Everything gets life because of Apa. That’s why Apa is the cure. Yes, water can said to give life to everything in this world. But Aruna Prasnam talks from the time of the beginning of Universe. From the beginning of Universe to now, Science says, it is photons that give life to everything. Thus again, many people interpreted Apa as Celestial Waters (like Aurobindo). The thought-wishes the spell of Vajra, the cousin-brother to Apa, strikes and spreads Apa. Vajra is said here as the brother of Apa. The same fact is also seen in Rg Veda Mandala 1 Hymn 32 where it is said that Indra’s Vajra strikes the mountain and releases the Apa. I had mapped it to weak force decay leading to leptons, formation of atoms and release of Cosmic Microwave Background (Photons). The spell of Vajra desires Vigor/energy, Radiance, Physical forms and heavenly bodies. So great (etAvat) is it (va asti), large is it (yAvad etat), certainly large it is (yAvad eva asti) that contains (tad avarundhe) the will (tad vratam) of him (tasya) purely (dhAvet) varshati (rains/flows). With the spell of Vajra, its brother, Apa spreads great, so great that it all contains the pure flow of the ‘Will’ or ‘Command’ (vratam) of the thought-wisher (cit VitA). In other words Apa is so greatly spread as the ‘Will’. Science also says the same thing. The Cosmic Microwave Background, which are photons released when atoms formed in the early Universe, are spread large all through the Universe. Taking Vajra as thunder, does the thunder spread water such a great great extent..? But yes we can visualize wherever thunder strikes there is a possibility to rain. But weak force decay strike spread the CMB photons all through the Universe. Apa is nectar like as it has Nectar’s unbroken-ness (anantarit yai). The secretion of Apa (apsu mutra) made the Solid (pUrisham kuryAt). Apa’s unbroken secretion made the Solid. pUrisham means ‘Solid’. Science says from photons ‘secreted’ the ‘fermionic’ quarks and leptons which formed the hadrons. In the Quark, Lepton epochs few hadrons and leptons remained (got secreted) which caused formation of atoms. The fermions are the ‘Solid’ of the early Universe. Though fermions does not mean just ‘Solid’, even Purisham does not mean just ‘Solid’. It means something that is ‘stable’ and ‘opposite to that flows off or unstable’. Purisham in a way exactly indicates fermions as opposite to bosons. Obviously ‘water’ cannot secrete land, though one can visualize water receding and showing up land as water ‘secreting’ the land. Thus again Apa matches photons more than waters. Not just in spitting out, not just in the illuminated bathing, all the agni is deeply hidden (in Apa). The agni in Apa is not exterior. It is not in its spitting out nature or its bathing nature. It is deeply hidden. The agni or fire caused by Apa comes at depths. It is not in its illuminating nature or radiating nature. Obviously fire is not caused by Water. Fire is caused by Photons. Photons illuminate. They radiate. But the real fire caused by photons is at the depth of atoms, in helping to form elements, compounds and biological life. This agni (in Apa) burns (dAhAya) never bowing down (anati). Science says photons transfer energy at all times whether they impinge of electrons, protons or even quarks. The agni does not stand (tisThet) very much (adhi) on the inertness (hiraNyam) of Lotus (pushkara) leaves (parNani) . Science also says that the photons transfer energy irrespective of ‘inertia’ of where they impinge. This agni is not ascending/mounting (an abhyarohAya) when it does not consume (akSniyAt) the earth’s floating in liquid (kUrmasya). Science also says the transfer of energy from photons to other fermions happen only when they interact. IN other words the energy of photons can only be detected from their impact on fermionic matter. Note that Kurma here are those fermions that originated in the early Universe, when it was only photons. The agni does not slay (aghAtuka) the other (anya) fluids (udaka); those (enam) that become (bhavanti) living in that fluid (odakAni). Science also says the same thing. Photons form superfluid structures called Bose-Einstien condensates in the early Universe. In this fluid (Apa), fermions (kurma) and other bosonic fluids (W, Z, composites like mesons) form. The High energy of photons does not slay those other fluids/bosons. Other bosons (or odakani) continue to form in that fluid of photons. The non-slaying (aghAtuka) Apa collects/heaps (cinute) the fire/transfer of energy (agnim). This (yah) certainly (evam) is the highest of (ucainam) knowledge (veda). Water does not hold fire deep inside. But photons do. Thus the one who realizes the ‘fire’ in Apa (as Photons) has got the true knowledge. The thing that contains and gives the kurmam (fermions/baryons), Apa is the essence of that container. Since Kurmam has two meanings ‘tortoise’ and ‘earth floating in liquid’, Apa can be seen as ‘water’. But the wordings clearly say Kurmam floats in something whose essence is Apa. So that floating liquid contains more than Apa, but Apa is its essence. In the origins of Universe, before 380000 years of its age, was the Baryon-photon fluid, in which fermions, bosons and photons were together. The essence of that fluid were the photons, according to science. Then (atho) the collective existence (samasTyai) of all the heavenly bodies and planets (svargasya lokasya) was all of (sarva) photons (Apa) photons (Apa) photons, give us (asmAdita) our (asmAd) agni, vayu and Surya. At that time, the collective existence of all heavenly bodies and planets was all Apa. This Apa gave all Agni, Vayu and Surya. If Apa is just water, then we know it does not make all the heavens and worlds. It does not give Agni, Surya and Apa. To be giving Agni, Surya, heavenly bodies and planets, Apa has to be photons as science says photons lead to fire, nucleons, galaxies and stars. The ‘celestial water’ according to Science is the photonic fluid at the origins of Universe, which created all the matter and which flowed 380000 years after the Big-Bang as Cosmic Microwave Background. ‘This heavenly (nAko), the first (brahma) flowing/vibrating (zravo), Precious (rAyo), having material/wealth sons (dhanam putrAn), Apa devi (Apo devir), here (iha) placed (AhitA)." The Apa devi is placed here as the heavenly first flowing, precious, providing wealth. Science says the ‘heavenly first flowing/vibrating’ is Photons as Cosmic Microwave Background. Photons do provide the material/wealth as from the photonic fluid all the baryons, atoms, elements, compounds and life evolved. It is said that 'Apo Vishvatah paripantu", which means Apa runs/flows Universally. Ofcourse photons and not waters flow Universally. Apa are 'Vishva Bhesajih', which means they are Universal remedy or cure. Photons are indeed the Universal remedy or cure. When Universe formed it was photons that utilized the energy and originated everything else. When Universe stagnated it was photons that flew out and kick-started the evolution. Even on earth, it is the Photons that drive the evolution of beings. It is said 'Apah supteshu Jagarti' which means Apa wakes/rises up those that are sleeping. Light or Photons wake up not just people, but 'wakes/rises up' compounds and biological life. It is said 'Apo brhthi Visva sambhuva" which means Large Universe manifests out of Apa. The large Universe definitely does not manifest on water. We know that. We all know that Large Universe manifests out of photons. It is said that Antariksha is 'Apo sadastha', which means the inter-stellar space is the seat of waters. Obviously water does not reside in space. But photons as Cosmic Microwave Background do.